The lamb prosciutto spent about 30 days in its salt cure, and it was time to move it into the curing chamber to dry. I left it longer than i normally would, but I was traveling; no harm though...i don't think. 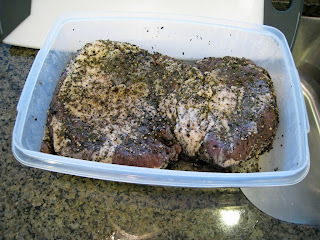 About 13 days into the cure I opened the container it was in, and flipped and massaged the meat. There was a cup or so of liquid that had been pulled out of the meat. By the end of the cure, the container was dry. I guess all that brine got reabsorbed into the lamb. It smelled AWESOME. I rinsed it off well under cold running water and then dried it off as much as possible with paper towels. 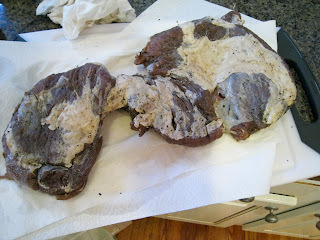 This is the other side of the meat after rinsing. You can see there is a portion of the muscle that is hanging on by a "thread" of meat. I found this also last time i made this. It must just be how it's butchered to remove the bone. I cut the muscle off, and made it into a second chunk. I didn't have a casing big enough for the large piece, i would have needed a 120mm casings, which are available, but the biggest i had in house was 100mm. No big deal, i just rolled it up really tightly and tied it up like a big roast, trying to get as many air pockets out as possible....really tie it up tightly. Same thing for the smaller piece. This picture shows side "A"
And here is side "B". Not quite as pretty. Both pieces were hung in the chamber, at 54 deg. F and about 75% RH. I think it'll take about 45 days for them to dry enough (about 30% weight loss). The smaller one might dry a little quicker. Only time will tell! I'll report back when I slice them. A quick glance and I thought, how the hell did he get a picture of my chamber? Because my hygrostat is in the same position as yours, and we have the same humidifier. I've not attempted any lamb yet, looks like I have something to add to the repertoire. that's funny scott. Give the lamb a try..it's great. Hi Jason, Ive been wondering when you were going to explain how you were going to hang and dry this lamb. After you fisrt posted the recipe I did it myself but only left the meat in the cure for 15 days. Did you end up using the gelatin to prevent mold growing on the inside? I also split it into two pices for the same reason. the small one already lost 32% and it only been hanging for 17 days but it still feels a bit soft in the middle. Do you plan on starting yours at 30%? frankie, i did not use gelatin this time. I'll see if i have any pockets that cause issues once i cut it. I'll have to check my notes to see how long i left it last time i made this a few years ago...maybe it was more than 30% loss... but i also don't want to make it too hard. I'm just about to pull my first lamb leg out of the cure tonight ( whole leg, no butterflied ). I bought a dorm fridge and a temp controller, but due to the small size, i'm using your idea of a super saturated solution to maintain a 65-70% humidity level in there. Your lamb looks awesome! This is off topic but I tried my first hand at making some Salami and Soperssetta a couple weeks ago. The recipes from Len Poli. I had now bacteria so I used live cultures of lactibacillus acidofolus. I also had nothing to induce the mold on the natural casings I used. 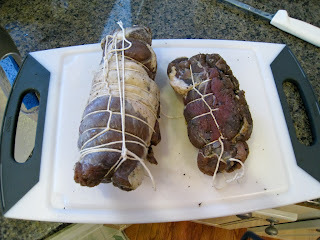 I stuffed then incubated the at 80 degrees 24 hours then moved them to the garage at 45-50 degrees 75% H. Kielbasa casings and everything smells and looks great but no mold on the casings. should I be concerned did I do some major no nos. Any help would be appreciated. I can send pics of hanging salamis. Thank for any help you can provide. chipman, don't worry if you don't have mold on the surface...i never used to get mold either, and they tasted great. Thanks for the help. Do you know if the lactibaccilus acidofolus is ok as a good bacteria to us in place of the butcher packer product? I really want the white mold is there something that helps to get this? I have no knowledge of using anything other than the standard commercial starter cultures. Sorry. You can get a spray on mold, M-EK-4 from butcher packer that is sprayed on the sausage after it's cased, and it will help develop surface mold. Thank you for the help Jason. How will I know when my Salami has dried enough? It has been hanging for almost 3 weeks in my garage it is drying nicely but it is still a bit soft. It is in Keilbasa size natural casings. I am sorry to ask so many questions but I would like to carry this tradition on and get very good a making different salamis. I also want to make a salami chamber so I can do it year round. Do you do yours year round? Should I stop asking so many questions? Maybe I will be able to help you with something. I eat my salami when they have lost about 30-40% of their weight. Yes, i make salami year round..no problem when you use a chamber. Questions are no problem at all..sometimes i'm not that fast at answering though. I noticed last night when I went to the mancave to check on it, that it has a few mold spots ( and they look a bit fuzzy ). So based on your previous postings.. white mold=good, but fuzzy mold=bad? What do you recommend? Ruhlman recommends wiping down with a rag soaked in brine or vinegar when "bad" mold is discovered, but I'm not sure about this one. ( I have a pic if you want to see it via email ). Hey Todd, funnily enough mine also started to get some white furry mold on it. Since it's white, it's probably ok, but i'm going to wipe it with a brine cloth or a mild vinegar solution, since the meat isn't in a casing...it's growing directly on the meat ,so i'll clean it. WOW sounds a bit scarey to me. BTW my regular salame "donkey dong" came out wonderful even with no white mold. Although I would prefer to have the white mold. My sopperseta is still hanging and almost ready for its olive oil soaking period of 30 days. Question? Is this common to soak the soapers for 30 days in Olive Oil? I've never heard of soaking in olive oil. Thanks for the assurances Jason... I was feeling the same way, but it's nice to hear from a pro. Thanks Todd, but i'm certainly no pro! shoot me an email and i'll give you my address. This year we have a very controversial NEW process that the professore introduced : dry packing them instead of sotto olio (submerged/preserved in oil) Go figure?! How do you calculate the percentages after a given recipe? I have a recipe (Gyulai Hungarian sausage) that has kg and grams in it and I'd like to convert the amounts to percentages like your recipes are - they are much easier to use to whatever the amount of meat you begin with. 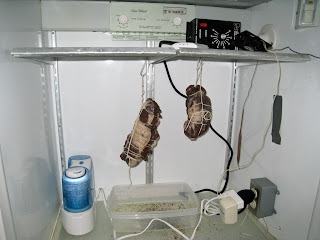 Also, what humidifier did you end up with in that picture in your curing chamber? Gabi, i calculate everythign as a percentage of the meat+fat. 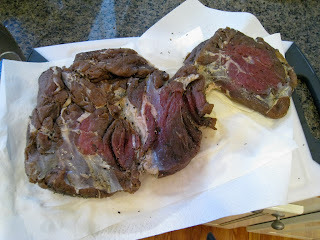 My lamb leg has been hanging now since about March 2nd.. starting to look great ( I used a mild vinegar solution to wipe the mold off ), however, it feels "tacky" to the touch.. almost sticky. I think that since the weather is ideal ( about 55-60 and about 70-80% humidity, I'm going to pull it out of the curing chamber and let it hang in the mancave... I'll do that for a week to see if the tackiness goes away. Funny.. when I first felt it, I thought of the pellicle that's formed when I smoke bacon or salmon. I previously made a lamp prosciutto (found it on the Internet - it was a recipe of yours). It turned out awesome. Is this based on that recipe? 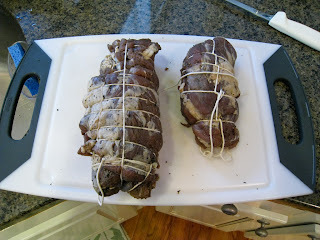 I was thinking of doing another lamb prosciutto shortly. Steven, yes, you probably got it from Len Poli? This is very similar except i used a boneless leg, instead of a bone in one. Hmmm... Never heard of casing being used for whole cuts of meat-- such as prosciutto or Lamb prosciutto. I always thought casings were only used for sausage? GE&H, nope, casings are often used on whole pieces too. 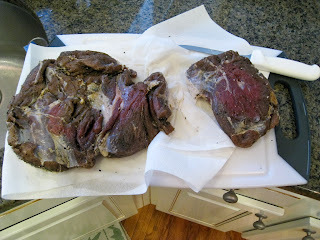 I am thinking of curing leg of lamb in bones, what do you think? will the bone cause any problem?, i am trying to imitate ham using lamb leg. why some times the fat tastes so good, and other time it get rancid, and should be removed before aging? Nabil, yes, a bone in lamb leg will work, there is more risk because of the bone, but if you're careful it should be ok. The fat flavor is really dependent on the age of the animal and what it has eaten. Lamb fat is a lot stronger tasting than pig fat. I don't think it should be removed before aging. You can remove it before eating if it tastes too strong.